Bug reports should be shared only with trusted people and apps. They contain app-usage, location and other data from system logs that might be considered sensitive. Sending bug reports via email should be used only if end-to-end delivery occurs entirely within a secure environment. Emailing bug reports can expose sensitive application data not otherwise obtainable to undisclosed recipients resulting in security and privacy implications. The bug report includes the standard Android bug report (.txt) and screenshot (.png) files. On devices with USB debugging enabled, bug reports also can be triggered silently from the Settings panel. Among the value-adds of Bug Report Manager is the Dialog, which can gather information from the person using the device on which a bug has manifested, often providing valuable insight to the root cause of the defect. A "questionnaire" appears when the bug report is generated, and can be designed by an organization to gather relevant information from the device user about activities that might have led to or caused the malfunction being reported. User-entered data is stored in a separate text file within the bugreport.zip. The construction of a Dialog is cumulative; any number of user-entry fields (Text Boxes) and field Labels can be added until all desired questions are asked and all data-gathering needs are addressed. SECURITY WARNING: Bug reports contain app-usage, location and other data from system logs that might be considered sensitive. They should be shared only with trusted people and apps. 0 none This value (or the absence of this parm from the XML) will cause no change to Bug Report Manager settings; any previously selected setting will be retained. 1 old Sets the device to use Android bug reporting functionality. 2 new Sets the device to use Zebra Bug Report Manager for bug reporting and handling. Controls whether an error report is captured when an app stops responding, and which type of report (Bug Report/logcat) is captured. A Bug Report contains information described in the Overview section above. The Android system log (sometimes called "logcat" after the command used to retrieve it) stores system messages, stack traces and log information written by apps running at the time of the crash. 1 NoCapture Sets the device to capture nothing when an app stops responding. 2 CaptureBR Sets the device to capture a bug report when an app stops responding. 3 CaptureLogcat Sets the device to capture the "logcat" when an app stops responding. Controls whether an error report is captured when an app crashes unexpectedly (non-ANR), and which type of report (Bug Report/logcat) is captured. A Bug Report contains information described in the Overview section above. The Android system log (sometimes called "logcat" after the command used to retrieve it) stores system messages, stack traces and log information written by apps running at the time of the crash. 0 none This value (or the absence of this parm from the XML) will cause no change to device settings; any previously selected setting is retained. 1 NoCapture Sets the device to capture nothing when an app crashes unexpectedly. 2 CaptureBR Sets the device to capture a bug report when an app crashes unexpectedly. 3 CaptureLogcat Sets the device to capture the "logcat" when an app crashes unexpectedly. Controls whether a button labeled "Take bug report" is displayed in Android's "Power-off" Menu, which appears after long-pressing the power key on the device. Bug reports generated using this feature are stored and/or sent using the handling preferences specified in Bug Report Profile parameter. Note: The "Take bug report" function also can be switched on and off and silently executed (no user Dialog) from the Settings panel. Most Power-off Menu functions are controlled by the Power Key Manager. 1 true Displays the "Take bug report" button on the Power-off Menu. 2 false Hides the "Take bug report" button from the Power-off Menu. 1 false Prevents bug reports from being stored on the device. 2 true Enables bug reports to be stored on the device. Used to specify the number of days after which a change to the on-device storage setting reverts to its default setting (disabled). Provides a means of temporarily configuring settings for testing, troubleshooting and other purposes. String containing the number of days (minimum 1) of a setting's "Time to Live"
SECURITY WARNING: Enabling this option might expose sensitive application data not otherwise obtainable to undisclosed recipients resulting in security and privacy implications. This option should be used only if end-to-end delivery occurs entirely within a secure environment, such as a private email system running over a private network. 1 false Prevents Bug Report Manager from sending bug reports via email. 2 true Sets Bug Report Manager to send bug reports via email (see SECURITY WARNING above). Used to specify the number of days after which a change to the email reporting setting reverts to its default setting (disabled). Provides a means of temporarily configuring settings for troubleshooting and other purposes. Note: At expiration, email address and related settings are erased and email delivery ceases. Controls whether a bug report can be triggered by an intent. Enabled by default. Bug reports are triggered silently (no user dialog) using the broadcast message com.symbol.mxmf.intent.START_FOR_BUG_REPORT. 1 true Allows an intent to trigger a bug report. 2 false Prevents intents from triggering bug reports. 1 true Enables screenshots to be taken and saved with each Bug Report. 2 false Prevents screenshots from being taken with Bug Reports. Controls whether to upload bug reports to the Zebra Cloud. When this feature is enabled, data is stored temporarily in a private area on the device until transport to the Zebra Cloud is complete. At no time is this pre-transport data available to users or third-party apps. 0 none This value (or the absence of this parm from the XML) will cause no change to Bug Report Manager settings; any previously selected setting is retained. 1 false Prevents bug reports from being uploaded to the Zebra Cloud. 2 true Causes bug reports to be uploaded to the Zebra Cloud. Used to specify the number of days after which a change to the cloud storage setting reverts to its default setting (disabled). Provides a means of temporarily configuring settings for troubleshooting and other purposes. Shown if: CloudEnable parameter is set to "True"
0 none This value (or the absence of this parm from the XML) will cause no change to the Bug Report Manager settings on the device; any previously selected setting will be retained. 1 ClearDialog Signals the beginning of a new dialog box layout. 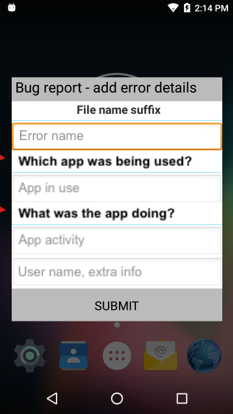 2 AddErrorNameTextBox Adds a Text Box for providing a bug name, which is appended to the file name of the bug report and becomes name of the file containing user-entered data within the report. 3 AddLabel Optional static text field used to ask a question or provide instructions for entering data into a Text Box. 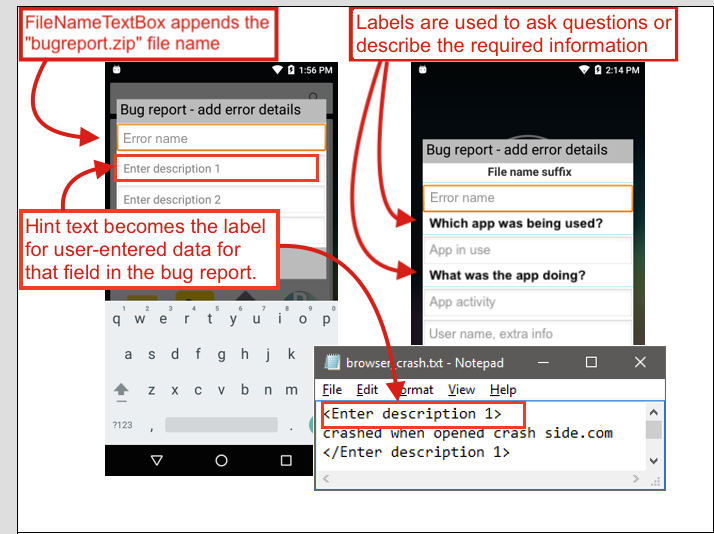 4 AddTextBox Adds a blank Text Box into which the device user enters information about the bug being reported. 6 AddVoiceRecordButton Displays a button for activating a voice capture function for creating a message to accompany the bug report. 7 LayoutEnd Signals the end of a dialog box layout. 1 true Enables the Dialog timeout to be set to a custom value.